I’m a list maker, as has been discussed more than once … and I stand behind my list making tendencies as I have found that it really does aid in my productivity and overall clarity of what the hell I am trying to accomplish. But, yesterday I had the misfortune of sitting down with the City Boy to compose what we have now named “The Married List”. (Insert dramatic music here). As everyone knows, when a couple becomes Husband and Wife, there are arrangements that should be made to insurance policies, and name changes, and combining finances, etc. But due to the City Boy’s background and PASSION in the investment/insurance realm, his eyes light up with the thought of modifying policies, changing beneficiaries, increasing benefits, etc. If you ask me, I think he’s just a little too insurance-prone. I jokingly said yesterday that I’m glad there’s no Breathing Policy clause to add to our life insurance or he’d probably be all over it. But, I kid. He’s really not that bad. So, that’s what we did … after just a slight argument on the importance of our Married List. I had gone to Sherwin Williams yesterday afternoon to pick up some sample cards for painting the house, and after deciding how we’d spend each other’s death benefit (I KNOW! Morbid, isn’t it?!?) we plotted the colors in the house we would LIVE in together. Doesn’t that just have a much nicer ring to it? Afterward we went to the grocery store, watched a movie and then watched the Orlando Magic beat the Charlotte Whoever-They-Are in their first series of the NBA Play-Offs. I don’t like watching the regular season games, but once there’s something at stake I really like to watch how our boys do. And our team this year is doing pretty well! Next year I’d like to see a game in person though … I guess we need to start thinking about babysitters! In pregnancy news, I started the fifteenth week today. Lately, by mid-afternoon my good mood and lifted spirits begin to wane and the sleepiness settles in. But the nausea has become less and less of a thorn in my side throughout the day, which is a tremendous milestone! However, now that I’m not wishing for death on a constant basis, I worry that something is wrong. And, I know! I’ve read enough of the pregnancy articles and books to know that this is totally normal during the start of the second trimester. I’m seriously considering the purchase of an At Home Doppler system to keep an ear to the baby’s heart beat. But, that’s crazy isn’t it? OH MY HEAVENS! 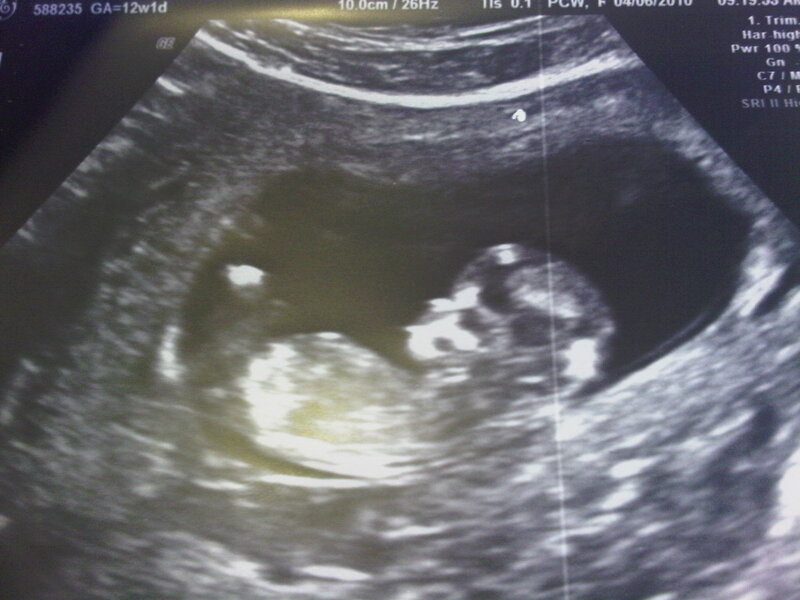 I had an ultrasound two weeks ago and totally didn’t post the new picture of the World’s Cutest Baby! What the hell am I thinking? Look at my little angel?! She's just kickin' back - hands on her head, enjoying her day! Total Random Thing: I somehow managed to Netflix the debut movie for both Owen and Luke Wilson over the weekend. It is called “Bottle Rocket” and was released in 1996. Is it a good movie? No. Are there some interesting comedic elements to the flick? Sure. Would I recommend it to anyone? Um, nah. It was just a goofy movie with both brothers. They both look very young, and if you’re ever really bored and are looking for a nice movie to fall asleep to, I think this is what you’re looking for. Enjoy! This entry was posted on Monday, April 19th, 2010 at 3:46 pm and is filed under Baby!, Life!!. You can follow any responses to this entry through the RSS 2.0 feed. You can leave a response, or trackback from your own site.